I’ll start this out with the theme that’s been prevalent in all of my writing from the last week: Finland is absolutely incredible. I love it here, I love the people here, and I wish I could take their culture of humility and generosity back to the United States. Who knew that a last minute trip to a country I never really intended on visiting could be so great? I sure as hell didn’t expect any of this. My last night in Helsinki was spent with Brady, who is my editor over at Electronic Gaming Monthly. I actually spent most of the week hanging around with him, which arguably made the whole experience that much better. Traveling abroad and talking about how amazingly different things are with Europeans usually makes you just look like an ignorant American, but it was great to be able to discuss all of the great things we saw in Finland together with another American. Restaurants in Helsinki are a little strange compared to what I’m used to. I’m not entirely sure why this is, but it seems like they either have low-grade fast food like McDonalds, pubs that might have a small menu, or high-end restaurants that would be expensive even if you were paying the menu prices in dollars- Much less Euros. There’s no equivalent that we could ever find to, say, something like Applebee’s or some other middle of the road not too expensive place to eat. After wandering unsuccessfully for quite some time, we stumbled across the cleverly named Bar Celona. It’s a Spanish themed tapas bar, which seriously just could not have been more perfect. It was almost empty and staffed by an old man who couldn’t be more of a stereotypical Spanish European, and an incredibly attractive Spanish waitress who seemed to have limitless knowledge of the wine they had on hand. It sort of inspired me to become more of a “wine person” because I don’t have much of an excuse as a well-off 28 year old white male to not at least know some of the wine lingo. Anyway, this place served as a blatant reminder of just how much I loved Barcelona, and how much I need to get back there. The tentative plan right now is to attend the first round of the International Mobile Gaming Awards in late January, then just take the train down to Barcelona and live there until Mobile World Congress in late February. If I can pull this off, I’ll spend my birthday in Barcelona, which just couldn’t be better. A few things have me a little nervous about this whole idea though. First off, my Dad’s health makes me a little nervous about leaving the country for a little more than a month. If something happens and I need to quickly fly home, I could be looking at potentially thousands of dollars in air fare. Secondly, GDC, which is arguably the most important event for TouchArcade runs from March 5th through the 9th. Plans as they are for Mobile World Congress would have me back in the USA sometime on March 2nd, then on a plane to San Francisco again two days later. Spending that much time in Barcelona will have me fully adjusted to their time, which means what my body thinks is 8:00 AM in Barcelona will actually be 11:00 PM the night before in San Francisco. That’s… really not good, especially with how insanely busy GDC is for us each year. I suppose I could spend my last week in Barcelona attempting to re-adjust to what would be California time, but that just means I’ll be sleeping during the Spanish day, which sort of defeats the purpose of being there if I need to switch things around so my post-work free time is at night when everything is closed. I guess I could get into night photography, that might be sort of cool. Eh, let’s table this for now. The journey home from Finland was mostly uneventful, and went according to plan. I mentioned on Twitter that I felt genuinely bummed to be leaving, and that couldn’t be more true. It felt really sad to be driving past all the areas I spent the previous week walking around, but that soon faded into excitement to be home again. After a short flight from Helsinki we landed in Copenhagen, which is probably my favorite airport. I seem to fly through it whenever I go to Europe. It’s like an ultra-high end shopping mall, but with planes. I always seem to forget that there’s nothing but a poorly stocked 7-11 once you go through customs to leave the European Union, so I went through customs once, and decided to go back through again to get some food during my two hour layover. The customs agent letting me back into the EU was sort of a jerk about it, warning me it’s not good to have so many stamps in my passport, but whatever. It all turned out fine. 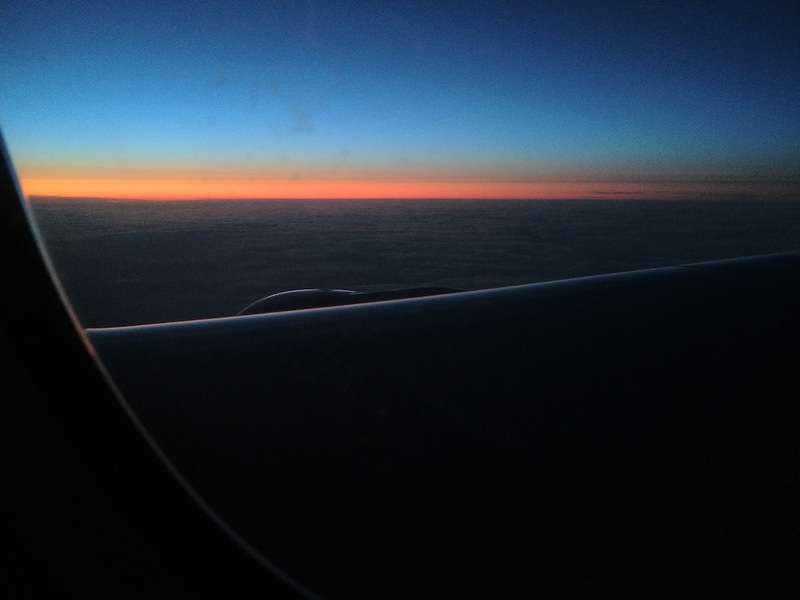 The flight from Copenhagen to Chicago was perfect. I love flying east to west late in the day, as the sun stays at a perfect position for a permanent sunset on the horizon for the entire flight. It’s stupidly gorgeous, and never stops. I tried to get some better photos of it, but only had so much to work with between my iPhone camera and the airplane window. The flight was fairly empty too, so I actually got to stretch out across a couple seats. I think I might have slept a little bit, but I can never really tell. Upon landing, I sailed right through Homeland Security without a single question, picked up my bag, and my friends were there to pick me up from O’Hare moments later. The perfect end to a perfect trip. I can’t believe I almost turned it down.